Seems to be all the rage in America! Well, I need to tackle so many things today. Little Boys room was still not ready to move into at the weekend, in fact, the room looks worse than when I actually started it. So, in my own true style…I’ll leave it! Instead, I’m going to give my car a clean-out then take it to be washed. That itself is a great task for me. My car has only been spotless once, the day I bought it. I look around the house and think ‘Must do that soon, must clear that out soon, must take that to the recycling tomorrow’ so much to do, so little time. I tried very hard last week to become more organised, but it’s not as easy as I imagined! So, I’ll try again this week. If I do get the car done today, it will be a start! Whilst blog-hopping the other day, I came across this great site… Click MESS! I thought I would love to get involved with the other clutter-blogging females in the world. 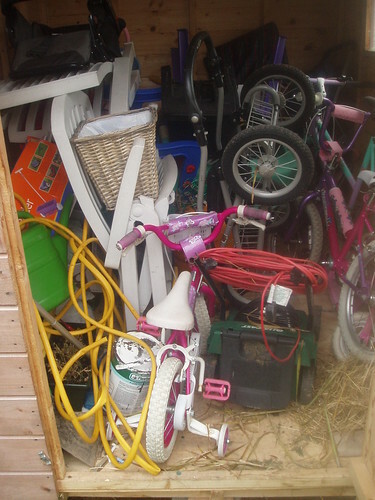 So, I have set myself the task of de-cluttering a particular area of the house/garden starting with the shed!